Azure Dynamics landed its single-largest order this week with Purolator ordering 600 hybrid vans to be delivered over the next three years. With its latest order, Purolator will operate the world’s largest fleet of Azure’s Balance hybrid electric vehicles, with 955 units. 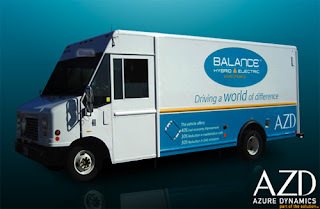 For the order Azure is integrating its hybrid electric vehicle technology, which includes lithium ion batteries, is into Ford’s E450 chassis with a Ford 5.4L gasoline engine. Ford has been Azure’s key partner for about a decade. The first 200 units in the order will be built and delivered to Purolator primarily in the third and fourth quarters of 2011 to facilities across Canada. Azure says its Balance hybrid electric can improve fuel economy by up to 40%, while reducing carbon emissions by up to 30% in city conditions. “As a result of our long and mutually beneficial relationship with Purolator, our Balance hybrid electric volume has consistently increased allowing us to reduce internal costs, refine our processes and implement product upgrades,” said Scott Harrison, Azure’s CEO, in a release. He added that, as Azure’s first multi-year order, Purolator’s order helps the company build a predictable product backlog.